Windows 98 through to XP will take an image and when stretch is selected, will make the image fit the screen, regardless of its original aspect ratio (the ratio of the width and the height). Copy the files in a zip across to your machine by clicking here. This is the original which copies the effects described in HelpDesk, issue 210. It is just 2 pixels which look like the image on the left but when used as a Windows background desktop image, are interpolated to form the image on the right. Note that when it is on the screen, the 2:1 aspect ratio is lost to make the 4:3 aspect ratio used by computer monitors. This will work equally well for monitors whether they are in: 640 x 480; 800 x 600; 1,024 x 768; or, even 4,000,000 x 3,000,000. These two bitmaps give you the primaries with black and the secondaries with white - again, they are smoothed out as in the images on the right and squashed into the same aspect ratio as your display. Bitmaps this size can be difficult to edit so make sure that your image editor can zoom in far enough. Here we expand recklessly into the domain of psychedelic extravagance as we put both the primaries and secondaries together in rainbow order. Well, why not? You can use any colours you like as well - it doesn't have to be primaries or secondaries. You don't have to stick with fairly screen proportioned aspect ratios either although you should remember that it will squash everything into that space. In issue 207, we covered how to make a USB webcam take close-ups at almost zero cost by using a low-cost lens recovered from a disposable camera. This issue, Emma Tandy asks how we can find the new depth of field. At the top, we have a normal lens (A) focussed at what we all assume to be infinity and below it, we have added another lens (B) to bring 'in focus objects' closer. However, this is not the whole story. With small format cameras or digital cameras, the maximum number of lines per unit distance across the negative or detector is limited which means that the cone of 'focussed light' can be wider - forming a triangle at the object and in the focal plane - which in turn means that the object can have some depth within the space that is in focus. This space is called depth of field (depth of focus is the same concept but at the negative or detector). An artefact of this is if the lens is focussed on infinity, there is a depth of field in front of that and also a depth of field 'beyond infinity' As there are no objects that we can see that are beyond infinity, this extra depth of field can be used so that the lens is focussed at a point that is, say 4m away and from 4m to infinity is the part that is in focus beyond and between 4m and 2m is the part that is in focus in front of this. Focussing at a point that is in front of infinity but using the depth of field to make everything up to infinity in focus is called 'hyperfocal focussing' and is dependent upon the depth of field. On an SLR lens, you can see the guide depths of field based on the F number and an assumption about the size of the final print (miniature - 35mm - cameras are based on the assumption that the final use will be a 10x8" blow-up). To calculate the new depth of field, you need to use the depth of field that is given and assume that it is hyperfocally focussed (you aren't going to be able to change the focus on a webcam). If you take the infinite focal length and the close focal length and work out the new values based on the focal length of the lens, you can work out the depth of field for the new lens combination. This depth of field can be used to take photographs of things that have depth and give the impression that it is all in focus. In the example on the right, we see how the rays go (the lines representing roughly where on the negative or detector they go rather than whether or not they are in focus) when we take a photograph of a building. The top and the bottom of the building are out of focus but if we stop down the lens (increase the F number), we can make the cone of light narrow enough to give the impression that it is in focus. Something that some people don't like though is the converging verticals (because we all know that the real building sides are parallel). To combat this, we can make sure that the film plane, the lens plane and the object plane are all parallel, therefore they will all be in focus and there will be no rectilinear distortion. However, we can now only photograph the bottom half of the bulding. In order to get around this problem, larger cameras such as medium format and plate cameras get around this by using a lens that can produce a larger image than the negative. If this lens (which as the same focal length as the ordinary lens) is slid upwards on the rising front, the planes are all still parallel so all is in focus. Occasionally, in the market place, you will find a miniature format (35mm film format) rising front attachment. Now, what about those converging horizontals? - let's face it: a 2D representation of a 3D object is only a lie so the camera always lies. Note that theoretically speaking, parallel planes coincide at infinity. If you make the lens and image planes coincide elsewhere, your object plane of focus will intercept this point. If you wanted to take a picture of some railway lines and you wanted all of the sleepers to be in sharp focus, you make the lens plane intercept the film plane at the sleeper level by tilting the front of the camera. When the photograph is blown up, people will comment on how clear and in focus the whole image is. Although this might seem a little esoteric, if you have a second hand camera that its previous owner has dropped badly, the lens mount might be off enough to cause this effect which will explain those peculiar photographs it takes. Firewall logs often have a time-based feature that, whilst it still reacts as directed on events of a given type, it will not log any more of them until the specified time is over. For example, if you have specified a time of 60 seconds and you receive 5 events in a minute, then only the first one will be logged. If nothing happens for another two minutes, the next event will seem to have happened around three or so minutes after the first. While having a non-logging time of some description is clearly effective at cutting down the firewall log, it hides the magnitude of the real problem. 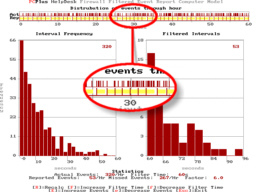 The shot on the right shows a bit of a typical log with events occurring no more frequently than once per minute. I set my firewall to log dropped ICMP packets and it registered the type 0 packets at the hourly levels in the graph on the right. Whilst 35 per hour doesn't seem to be very many, the real number is quite different. The reason for the rate increasing is probably due to increased traffic on the ISP's local subnet. 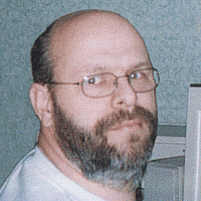 Click here to copy the computer model onto your system or run it directly from the disk (it does not write any files). It needs an environment that will run DOS. Although heavily bloated as DOS shells go, Windows will also do. If you run the computer model, you can put any number of hits per hour in, up to a limit of 3600 and it will calculate how many hits will be reported for the time limit that you have specified. If you press the recalculate button a few times, you will see how this number varies and you will also get an idea of how underreported the actual figure is. Clicking 'About' will give you some basic information about the program and how to use it. This is a screenshot of the graphical output of the model. You can see from the blowup section that the yellow bars represent the 'time-out' time for the log - where nothing gets reported. There are a lot of events in this time and this is where the model comes in. Note also that the distribution of event intervals is not a 'normal' distribution. This is because the events are not all based on a single starting time (such as everybody switching on their computers at 9am or going online in the evening) but are from all over the network where there is no single trigger event. Dynamic Host Configuration Protocol (DHCP) is defined clearly in rfc2131 so the problem of losing your ISP allocated IP address should not happen in the first place. However, checking your firewall options, using the option to give your firewall a name and allowing it to be Pinged should help. Regarding allowing incoming Pings, one way of tackling the problem, if this turns out to be a solution that works, is to look at the firewall log and check the IP address of the host that pings you. If this is the DHCP server, it should coincide with the DHCP server's IP address - remember that you could have several servers although your firewall should be picking only one of them and respectfully ignoring the others. If this is the case, you can set up a firewall rule that will only allow Pings from the Internet if they come from the server that matters - the DHCP server or the host that checks to see if you still exist - nobody else should be able to ping you then. Note that your ISP's DHCP server might have a local address so might be in the form 10.x.x.x, 172.z.x.x where z is a number between 16 and 31, or 192.168.x.x, ie your LAN works on your local network and this is plugged into your ISP which is another, although larger local network with its own local addresses and so on although from the outside world, you appear to have a proper IP address - this is just mapped. These things should be done one step at a time to check what works and what doesn't. If you have got a substantial network, you don't have to let anybody know about it. Choosing 'Home' as your firewall name could save you from logging your ISP attacking your system to see if they can find more than two machines. 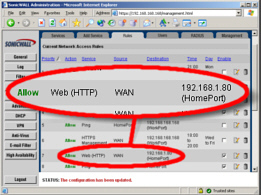 If you have more than one http server on your machine - one for your webserver and one for your UPS as an example - you should already have them set up so that they are each available through different ports (80 for the web server and, say, 8080 for the UPS although they don't have to be these numbers). You can prevent your UPS from being available to the Internet by blocking everything other than port 80 at the firewall. If this incoming port 80 traffic is passed by the firewall through to the machine specified, at port 80 (or whatever port you have specified for your webserver), it will work all right. As this is the only machine that the firewall will allow port 80 traffic through to, the others are reasonably safe. Note that if your webserver has a security loophole in it that allows arbitrary commands to be executed, then none of the rest of the network can be considered safe so it is wise to keep up-to-date with security patches. 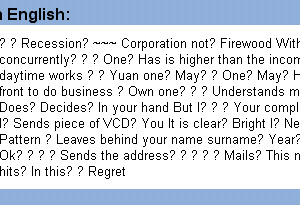 If you have a site that is visited by people from all over the planet, you can expect some mail that needs translating. This is the plain-text of an email I received and I needed to find out whether it was a genuine enquiry or just junk mail. 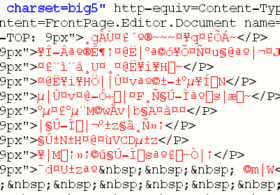 The part I've highlighted in blue tells me that it uses the Chinese Big5 character set (the characters are formed from the pairs of characters highlighted in red) so, having checked that it contains no scripts (or having removed any that were there by loading it into Notepad and searching it for '<script' (no quotes)), I saved it as a html file onto the desktop and loaded it into MS Internet Explorer. This is the text that appeared and, personally, having no more ability to read Chinese characters than I do to play Mah Jong (the proper game, not the pairs matching game) it is clearly a job for an online translator. 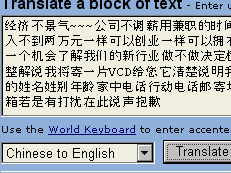 Select 'Chinese to English' and click on 'Translate'. And this is the result. As sometimes happens with these things, there are so many hidden meanings and sayings convoluted into everyday speech that the translated result can have little meaning, let alone let the translator program have a chance. Chinese Big5 (or traditional Chinese) is only one of the ways of writing Chinese. Another popular notation is 'simplified Chinese' (GB2312) and there are translators for free download on the Internet. This one will allow you to translate between the two in either direction, either from directly typed (or copied) text, or from within HTML files, the latter going to an output html file. ... and this is the output. Sadly, nothing about rocket science - just junk mail. An increasing number of appliances that you are likely to have plugged into your network have a network browser configuration interface. Whilst this is clearly a good thing in so far as you can configure these appliances without even getting out of your seat, there is something that should be considered regarding access - security. 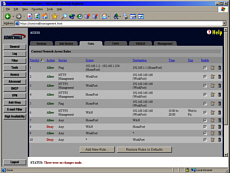 Firewalls usually have a web interface and secure a connection using SSL or, for those that do not use a web interface, a COM socket on the back that only goes to one machine. 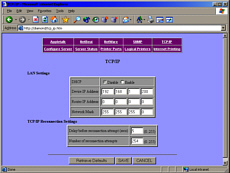 With a web browser interface using SSL, you can configure a rule that allows you to configure the firewall from the Internet only between certain times and, if required, from a certain IP address if you really want to. Clearly, firewalls that have a web browser interface have the advantage here as having a specific machine that you have to use locally to configure your firewall creates extra hassle and expense. It is clear that a UPS should be secured by a password (as this one is) as it is capable of shutting down the machines it powers. 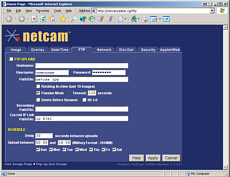 This is one of the browser configuration screens that are used to configure a webcam - a proper server that has its own network interface, not a USB plug to go into a local machine. If this is for a camera that is situated in the middle of nowhere, you don't want to have to travel hundreds of miles, visiting each one every time you want to change a few server parameters. When you have browser configurable devices, you should have a firewall becasue without one, everybody else can configure them for your and even if they are passowrd protected, unless there is a time lockout, they can hack into your system resources whenever you aren't there. These are the two sda Linux icon files for the slick theme. Copy them into your slick theme directory - usually /opt/kde3/share/icons/slick/48x48/devices. Click here (mount and unmount) to copy the files.